A quick google of the purpose built skiing resort of "Flaine" reveals one thing above all else: most people think it is extremely ugly. Built in the 60s by one of the most respected and renowned proponents of modernist Bauhaus architecture, Marcel Breuer, the resort (much of which is listed as protected by the French Ministry of Culture) had nothing but noble intentions: "We came up with the idea in 1959 to create, somewhere in France, a prototype for urban planning, architecture and design, the immediate profitability of which would be less important than aesthetic choices and respect for the environment" said Eric Boissonnas, founder of Flaine, in 1994. A geographysical engineer by trade, Eric and his wife Sylvie became fascinated by architecture, design and modern art, and decided that they wanted to involve themselves in the burgeoning winter sports industry in France. They built a team, found a location and embarked on a project that they saw as building "a housing concept designed for a new mountain lifestyle." Marcel Breuer, known among other things for designing the Whitney Museum in New York, the UNESCO Palace in Paris, and most recognisably the Wassily and Cantilever chairs, was chosen as architect for the ambitious new project and work began in 1961. The resort was to be car free, and designed to reflect the surrounding mountains in its use of colour and shape. "Buildings should not be subject to fads, but reflect a general and lasting quality" said Breuer. "Architecture must be based on utility. Irrespective of symmetry, it's intentions should be more direct, as well as it's moral and social responisbility ... The builder should feel free to reject tradition, free to be scientific, human, nontraditional." The resort opened in 1969 and during the following years acquired a public art collection that would be envied by most large cities - permanent outdoor sculptures were installed by the likes of Picasso, Victor Vasarely, Jean Dubuffet and Carl Nesjar. 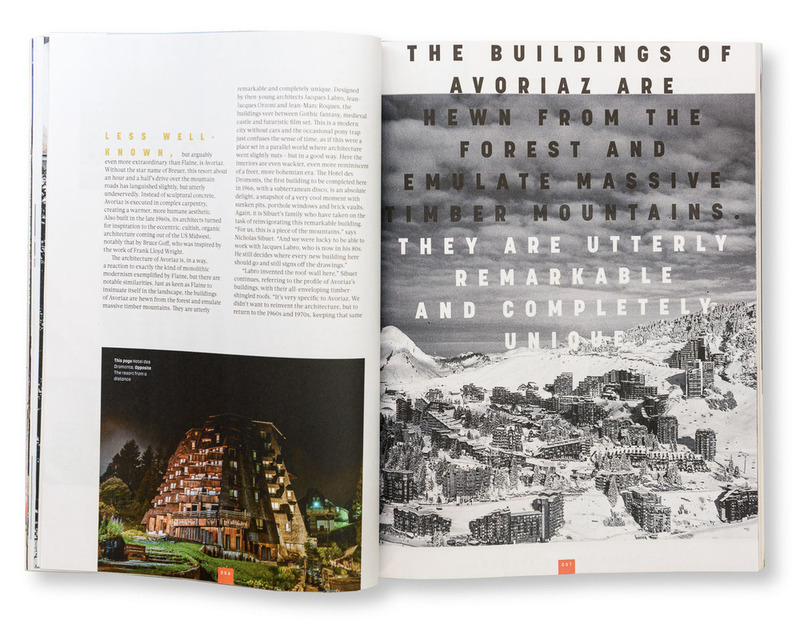 I was commissioned to photograph the resort by Easyjet Traveller magazine, who had seen the work I had done on another conceptual 60s purpose built skiing resort, Avoriaz. I had heard about Flaine before and was eager to see what it was really like - you see, I had a theory about why everybody disliked the architecture so much. Growing up in the 80s I was constantly reminded by my parents and their contemporaries that everything had been ruined in the 60s - town centers, housing estates, car parks, libraries, hospitals - and the main culprit was concrete and modernist ideas about a utopian future gone badly wrong. My parents are not architecture afficianados, and neither are most of the people that go skiing in Flaine - or "phlegm" as it has unfortunately become known - but by the time the 80s rolled round, modernist, brutalist concrete was not only extremely unfashionable but also almost offensive as a symbol of everything that had been cocked up by town planning and urban redevelopment. Not to mention the fact that most people's idea of a nice skiing holiday involves cosy cabins and log fires, not being packed like sardines into huge concrete blocks that seem to be the very antithesis of man and nature existing in harmony. As I got older and became interested in "visual" things, I began to re-evaluate these buildings that my parents generation hated so much and found that there was something I liked about a lot of them. True, a lot of them are just awful - and tragically replaced buildings that had stood for hundreds of years - but as I learned more about the brutalist movement and the intentions behind it, I understood and appreciated it more - and there is a reason why photographers are constantly drawn to brutalist structures. So off to Flaine I went, with an open mind and a feeling that there was going to be something not so bad about this place after all. What I found was a noble failure. I understand and admire what Breuer was trying to achieve, and there are some wonderful details in the resort all designed by the architect himself: the chapel, the door handles, the fireplaces, the signs, the windows and the amazing, cliff-hanging Hotel le Flaine, the first structure to be built, dramatically jutting out over a precipice. But the resort is a shell of it's former self - years of neglect have left the interiors of the buildings, which were designed as 4 star hotels, feeling more like the crappest youth hostel you have ever stayed in. One thing that stands out above all else when trying to judge whether the resort was a success or a failure, is that the architecture and the atmosphere it creates is almost universally disliked, and at this point in time, less than 50 years since completion, certainly does not embody the motto of Breuer that the architecture should "reflect a general and lasting quality". It is not a love/hate thing, it seems to be more of just a hate thing (the skiing on the other hand has always had a very good reputation). And while I certainly don't hate it, I don't love it either - but it is very interesting. I think that the way that we look at the buildings from the outside is affected by our experience of interacting with them and being inside them, and they have been so neglected and brought to a state that is so far from Breuers ideal that it is almost unfair to judge them in this light. Things are changing - a new hotel has opened in a refurbished Breuer building, the Totem Neige - and it has been done very well, breathing what feels like the first breath of new life into the resort in a long time. Interest in brutalist architecture is undergoing a resurgence, and at the Totem Neige the spirit behind Breuers version of the resort has been kept. One can ony hope that more hotels in Flaine follow suit: giving a rebirth to what could be a very unusual resort if it's original concept is adhered to, and a shining example of a certain way of thinking at a certain time. *These images originally appeared in Easyjet Traveller magazine February 2016. I visited in Christmas 2015, when the Alps had some of the worst snow levels on record for several decades for that time of year.